On June 16 2011, an Ealing Civic Society plaque was unveiled at the Brentham Club. Fred was a member of the Brentham Club from 1919 – 1935 where he played tennis and won their Championship in 1926 and 1927, before going on to win Wimbledon in 1934,1935 and 1936. The plaque was unveiled jointly by the Mayor of Ealing, John Gallagher and Roger Draper, CEO of the Lawn Tennis Association. Also in attendance were several local dignitaries including local MP Angie Bray, Leader of Ealing Council Julian Bell, several fellow councilors, and Members of the Brentham Society and Ealing Civic Society. 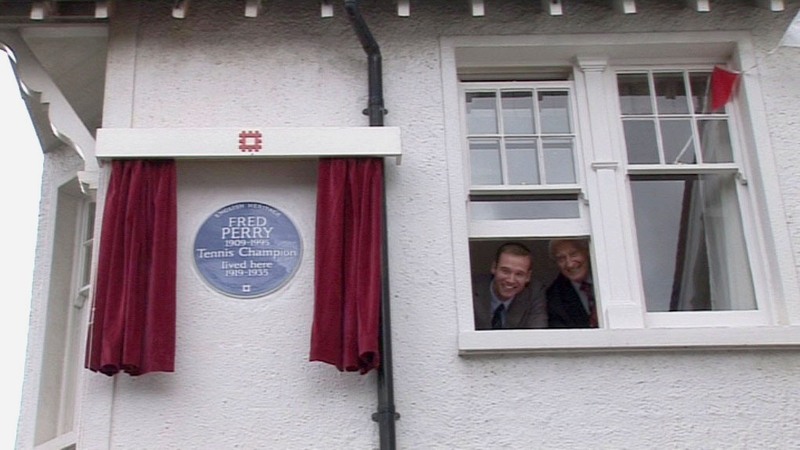 Then on 15th June 2012, John Barrett and Fred Perry’s son, John Perry came to the house at 223 Pitshanger Lane where Fred lived as a young man for the unveiling of an English Heritage plaque. Video | This entry was posted in Archived News and tagged Brentham Society, Fred Perry, Wimbledon Champions. Bookmark the permalink.